Earlier this year, the Convention & Visitors Bureau of Worthington released a four-minute promotional video about visiting Worthington. The video, which was produced by New Vision Media and created to attract tourism to the area, was selected as an Emmy Award finalist by the Ohio Valley Chapter of the National Academy of Television Arts and Sciences. "Congratulations to New Vision Media for their Emmy nomination for our visit Worthington video. I thought they did a spectacular job of capturing the energy and essence of the community," said Bill Purpura, Convention & Visitors Bureau of Worthington board president and editor and publisher of Home & Away magazine with AAA Ohio Automobile Club. "As we were going through the editing process, I began sharing it with outside parties in the travel industry, and each of them responded in the same way. 'It makes me want to visit,' they said. So I knew very early on that the Convention & Visitors Bureau of Worthington had achieved its goal with this project." The primary objective of the video was to show that Worthington is an attractive area. Once viewers are drawn in, they ask: What can we do there? That's why the CVB spent five months working with New Vision Media to create the video. They wanted to showcase the many great things happening in Worthington throughout the year, from the Worthington Farmers Market to local concerts and festivals. The video was judged on content, creativity and execution in the commercial category. Of the 865 total entries in the four-state regional Emmy competition, 300 were selected as nominees. New Vision Media worked closely with the CVB to feature a wide variety of activities, events and locations, including many scenes that were filmed using an innovative aerial drone camera. The video captures sidewalks and boutiques, bustling with shoppers, as well as behind-the-scenes activity at several Worthington restaurants. 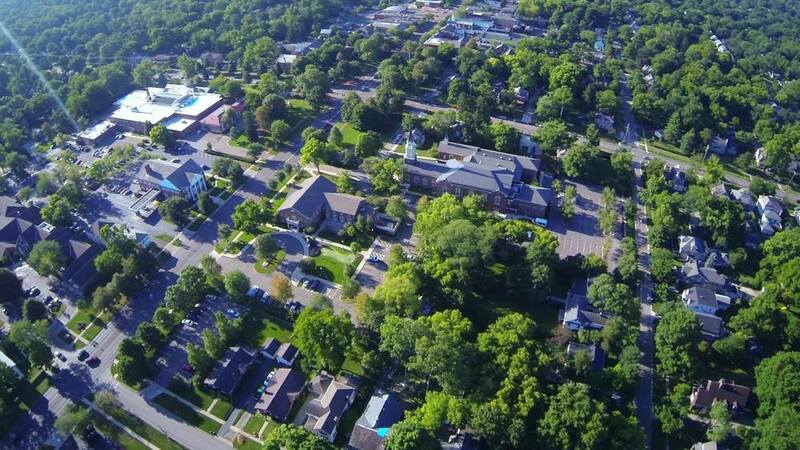 Businesses in Old Worthington and at the Shops at Worthington Place are highlighted in the video, along with scenes of visitors zip lining through trees, enjoying outdoor concerts on the Village Green, visiting booths at the Worthington Art Festival and shopping at the Worthington Farmers Market. In the video, residents and visitors candidly share their thoughts about what makes Worthington a great place to live and visit. One resident summed it up like this: "There's always something going on in Worthington." You can view the video at http://visitworthingtonohio.com/.